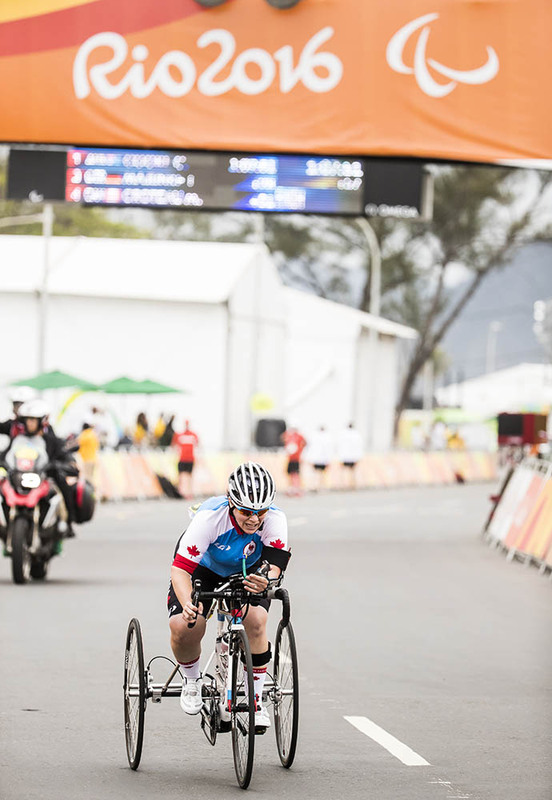 Four Canadian para-cyclists competed on Friday at the Paralympic Games in Rio de Janeiro, with Marie-Eve Croteau of Quebec City, Quebec, the top finisher, in fourth place in the Women's combined T1-T2 road race. Croteau and Shelley Gautier of Toronto raced in the combined category 30 kilometre T1-T2 road race. Carol Cooke of Australia took the gold medal, finishing 51 seconds in front of Croteau, with Gautier finishing sixth, three minutes and 46 seconds back. Gautier was the only competitor in the more severely disabled T1 category. "I am very proud of my race," said Croteau, "I didn't miss it [podium] by very much, and honestly it had been a while since I last rode in a pack. So the idea was to place myself at the back and look at how they were taking the corners, so that was about learning that. Afterward I took the wheel of the World Champion Carol Cook, the Australian, she is the strongest rider so the fact that I was on her wheel was good, I was protecting myself well. "In one of the last corners, the German took a wide turn and hit my back wheel and made my wheel pop up a little and that got my prosthetic unclipped at the same time, so I found myself after the turn with my strong arm on the bar and using my weak arm and there was another turn that was coming up, so unfortunately I couldn't take that turn correctly [and] I went more cautiously. So for sure I lost a few second there but I fought until the end, so that's a good thing, I really rode well. I'm really happy, didn't miss by much but I came here wanting to fight like a lion and that's what I did. The fact that I started and finished my race well [means] for me I have my podium." "I won't hide it," Croteau admitted, "for sure I was aiming for a podium, I understand that it was very close, that's really unfortunate but with everything that happened in the last four years ... I fought a lot, a lot, and the fact is that I had health issues [so] just the fact of being here, I can't be disappointed." "I think it went pretty good," said Gautier, who won a bronze medal in the time trial a day earlier. "I was the only T1 out there. I was able to stay with them [T2 riders] for a short while and then I was coming back, but the race ended before I could get to them. It was windy and a tough course, but I just went with it. I was time trialling it alone, which was hard, but I'm happy with my Games." 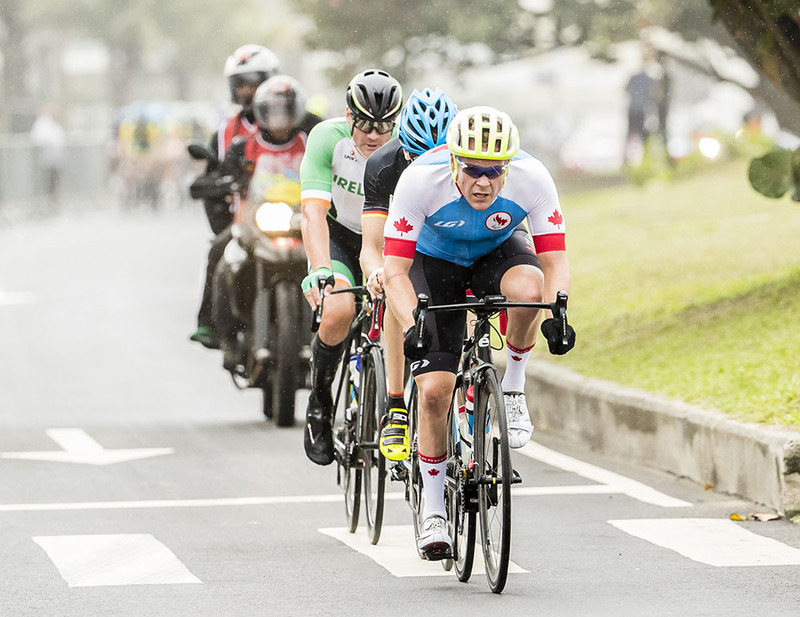 In the 71.1 kilometre road race for the combined Men's C1, C2 and C3 categories, Tristen Chernove of Cranbrook, BC, finished 15th overall, the third C2 finisher, despite a first lap crash that damaged his bike and injured his shoulder. Steffen Warias of Germany, a C3 rider, took the gold medal. Ross Wilson of Edmonton, a C1 athlete, and Michael Sametz of Calgary, a C3 rider, did not finish. "It was pretty tight in the group, and wheels touched, and I crashed," explained Chernove, who has already won gold, silver and bronze medals. "It's just the nature of racing; it was early in the race in the first lap, when a lot of attacks were starting, and from the right side a bike came across and clipped my front wheel. I felt really good and I was moving with the top contenders and feeling really strong. Absolutely I was expecting to be in a medal contender." "But I'm extremely happy of my efforts; both my [brake] levers were bent and I banged them back out. My front derailleur cable was broken and I had no front shifting, so I only had my small chainring for the whole race and had to spin at a really high rate the whole time. But I fought my way back to 15th, so I'm really proud of my effort and had to dig deep. It's been a wonderful Games, but right now I'm disappointed that I was taken out of contention for this race. I really wanted to win here today and I felt that I had a good shot at being on the podium." Wilson admitted afterwards, "It was insanely tough out there today. If you look at the wind and the nature of the course with the hills, it was tough right from the start. We knew it was going to be a hard race with lots of attacks, so I made a team sacrifice by going away [on a breakaway] right from the start, but that was all the matches in my matchbook, and I burned them pretty good. I was just happy to play my role in the team effort." "Unfortunately, we didn't get a result today, but we saw a lot of grit from Tristen, and I think if you look to the future, our team is going to be a force to be reckoned with over the next few years. We are taking home a record breaking performance, this is the most medals that Cycling Canada has earned in a Paralympic Games; it's a new benchmark. I think we are taking home possibility and opportunity for the future, and I think we have a bright future.